→Rat Race Rebellion Reviews – Is It Scam Or Legit?! What Is Rat Race Rebellion? How To Make Money With Rat Race Rebellion? Rat Race Rebellion Reviews - What Others Say About Them? Rat Race Rebellion Reviews [UGLY] Truths Unveiled! 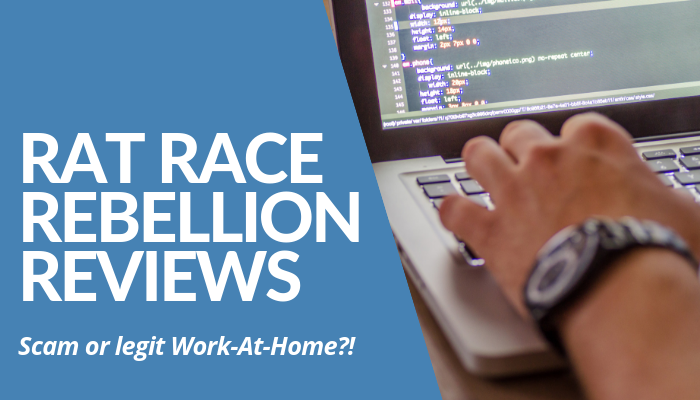 What Did I Like About Rat Race Rebellion As Work-At-Home Opportunity? 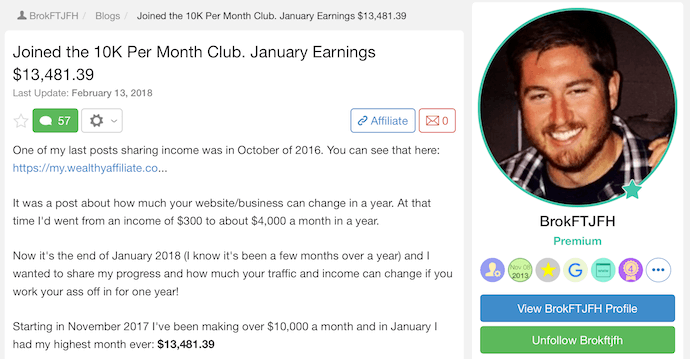 How To Earn A 100% Income By Working At Home In 2019? 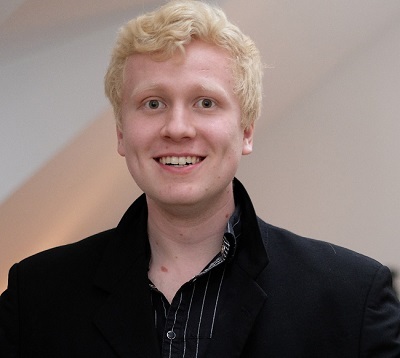 Rat Race Rebellion is born after Christine Durst and Michael Haaren's initiative to create a virtual workplace at home, preventing people to leave their homes and their families for a 9 to 5 work. It's taken its roots from their first online training company, Staffcentrix, in 1999, which was inspired by their youth. Before they became leaders of the virtual work industry, Durst and Haaren were into small-paying jobs to survive, such as hotel chain housekeeper, grocery store cashier, administrative assistant, clown, ice cream man, and many more. They've been to different jobs in various industries. Because of their aligned past experiences, they decided to create the Rat Race Rebellion to give an avenue for those who want to work at home. Since the establishment of this work-from-home movement in the late 1990s, Michael Haaren has been featured on CNN, Forbes, Businessweek, and among others. What they offer for other people, particularly those who want to earn in a small-scale, are various job opportunities structured for accomplishing at home. Hence, the site gives a somehow “job section” for these target markets online, replacing the classified ads on newspaper. In order to make money using this platform, you need to search for the jobs, obviously low-paying, to get hired and get paid. If you’re familiar with Fiverr and how Home Job Group works, you won’t find Rat Race Rebellion surprising or difficult to use. In general, Rat Race Rebellion is a brand of virtual work syndication, merely intended to list all the possible work opportunities in accord to the categories mentioned above. So, it’s up to you to search for the particular job you want to work as well as the payment in exchange for doing it. If you opt for a more stable income by doing a legitimate method, you can get our Ultimate Make Money Online Guide to learn the foundations of earning online. What Others Say About Rat Race Rebellion? In so far, there are more positive reviews from people about this Work-At-Home company or a job consolidator, if you will. Albeit the low-paying job availability, there is a lot of work opportunities provided for those who want to earn a small amount, enough for a sandwich or for a cup of coffee. The only downside is Rat Race Rebellion tends to have an exclusivity issue wherein it doesn’t welcome non-US citizens for the applicants. The registration is free and the membership is easy to do, but if you aren’t an American citizen or at least someone who resides within the North American boundaries, you can’t do anything but hope. As I’ve mentioned earlier, you aren’t allowed to join the membership if you aren’t qualified. 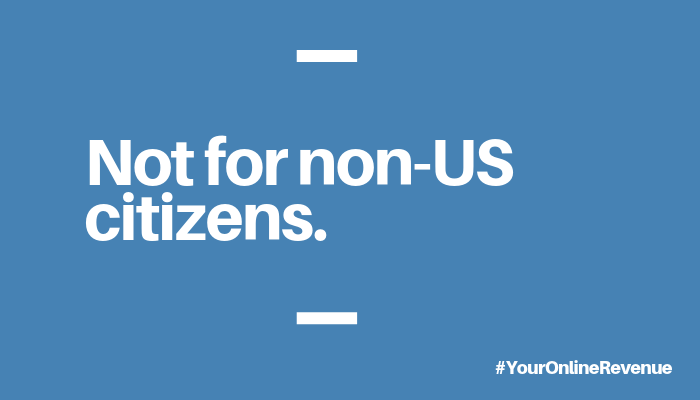 The only qualification that filters the majority of the applicants is to answer the question, “Are you an American citizen or live within the US at least?” If you say yes, you can apply. Otherwise, you can’t. Another thing to point out is to your fantasies hidden for a while as you read this post. You may think you can earn big or enough to sustain your monthly expenses by doing small-scale jobs as Rat Race Rebellion provides. To tell you straight to your face, no. Heck, you can’t earn much. Further, there are times when the job is scammy or sound too good to be true. That said, you also need to be vigilant with the work offer before you accept the gig and start doing it just like if you’re searching work opportunities on Upwork. This job consolidator is intended for small earnings only. And if you plan to sustain your monthly income by earning something online, grab our Ultimate Make Money Online Guide to get started. It’s the best option you have at the moment. There are many good points with regards to this Work-At-Home opportunity. 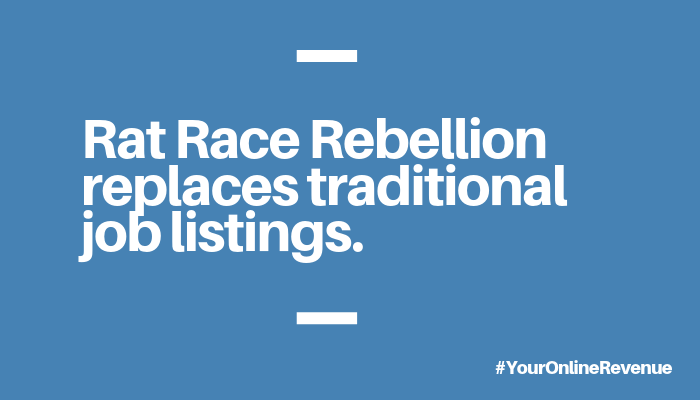 Rat Race Rebellion is a good place to start when you plan to earn a bit by sharing your skills and see how online jobs work. In fact, I started my online writing gig in the same process. Because the jobs syndicated on this website is in small-scale, it’s fast to earn some bucks. Thus, if you want to increase your income, you have to get the job done fast as well. 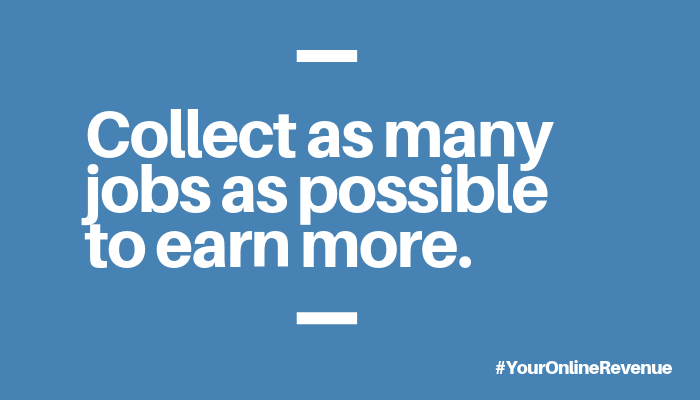 In that way, you can collect as many gigs you can per week and per month and see overall if this can give you extra pay (apart from your full-time day job). If you’re someone who wishes to save a bit, you can go to this website and register for free and without a hassle. That’s the best thing here. You have tons of opportunities to share your skillset to various potential clients. It’s up to you to choose and get hired. Simple. No drama. Disclosure: You have to be careful with some of the jobs here because there are times when scammy opportunities get through the site. Be aware. 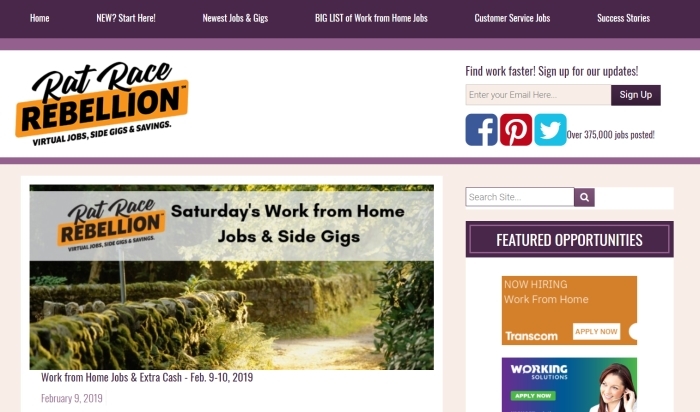 Altogether, based on the bunch of Rat Race Rebellion reviews I’ve read and on the opportunities I saw on their official website, there’s no doubt this job syndicator is a great jumpstart to earn something online. Especially if you only intend to earn an experience how online jobs work with pay. Albeit the small-scale and low-paying jobs, it remains a great option for you to have an overall feel of the online working as you typically experienced working a real, physical workplace. It’s different. Totally different. However, as for Rat Race Rebellion, there are downsides but it isn’t too negative, as they promote exclusivity to their applicants for the US citizens only. This is obvious because most of the jobs posted on the lists are within the boundaries. No international jobs or something related. Nonetheless, this virtual Work-At-Home opportunity is legitimate and a great place to start. But, it’s not a recommended option to earn a good monthly income. Unless if you’re willing to sacrifice your full-time job to earn low. Not a wise decision though. You see, there are tons of opportunities online and working at home is possible these days. Hence, you don’t need to go outside your lofty home to get dread in a workplace and do the tasks you’re not even interested. That said, I’ll tackle a bit of the other option I talked about earlier. If you get our Ultimate Make Money Online Guide, you’ll get through the whole process, the 4-step proven and legitimate method, to earn your first passive residual income. True. 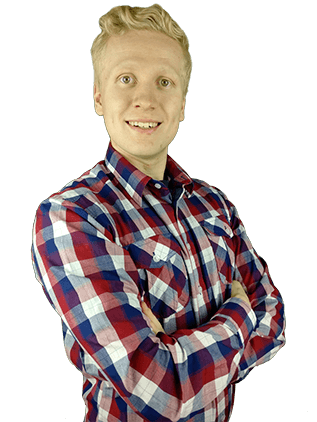 Roope “Robert” Kiuttu has been an affiliate marketer for 4 years now and has been running this website, Your Online Revenue Ltd, since 2015. Over the years of earning a satisfying and gratifying online income by doing something he loves, he has helped more than 3,000 individuals. He does this without compromising his leisure and travel. In fact, he’s roaming around the US now but he still manages to help more people and earn more at the same time. 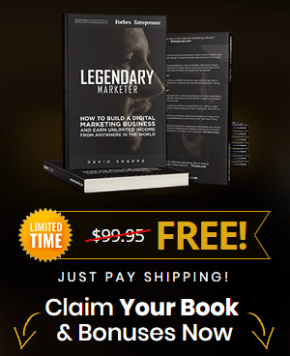 If you want to replicate his success, as well as the 13 other successful entrepreneurs, without risking too much, download our Ultimate Make Money Online Guide and start learning the foundation to your stable income online. Take a look at some of the successful A-list entrepreneurs. They are just a few people who succeeded in using the same system Roope is going to teach you. Besides the Rat Race Rebellion, you have a lot of options, including learning our 4-step method to start your own online business. I saw the program itself and I guarantee you, you’ll learn a lot. I’ve been on the writing industry with quite an experience in job syndications like this and I could say this program Roope advocate is legit. If you want to get serious with your online business in 2019, click the green button below and get our Ultimate Make Money Online Guide and start building your own passive income now. It’s now or never, my friend. Now that I have shared my thoughts and opinions in my Rat Race Rebellion Reviews post, I turn the table and ask your opinions about this network marketing company. What kinds of experiences do you have by doing Work-At-Home Jobs like Rat Race Rebellion offers and other job syndication companies? Are they worth your time, money, and effort? Do you prefer to begin earning your first passive income through affiliate marketing or you rather invest your time in Work-At-Home opportunities like this one? On the other hand, if you feel like you want to learn more about Roope’s step-by-step formula to make money online, leave a comment as well and he'll be happy to help you out. He loves to help people, especially those who are willing to give the work. That includes you.